“Vocalist Andy Lopez, who in the past played rhythm guitar, is now on standup bass, Jorge still plays lead guitar, and David Van Antwerp is on drums. Andy has been playing stand-up bass for only a few months, but his performance has become outstanding, the notes are right on, while he’s spanking that puppy hard and consistenly, never missing a bone-cracklin’ slapper! What impressed me much during these recordings is the tightness of the drums/bass combo and its relentless rockin’ Big Beat, which kept me shakin’ in my seat all thru these recordings! Add to this Jorge’s blistering guitar solos and you get some savage Las Vegas Rock’n’Roll for sure! I should add that Lopez’ vocals have become more aggressive and intense since we recorded the first CD. I was pleasantly surprised at the explosive energy level this band has achieved!! 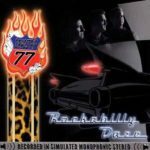 For those of you who like to label music categories: this one is both more “hard” and also more “traditional” than the first DRAGSTRIP 77 CD. More “hard” in the sense of more aggressive, more intense, more savage, not in the sense of “hard rock”. More “traditional” in the sense of being closer to 1950s Rockabilly (as opposed to “neo-billy” or “psychobilly”) than the first one was.